I wasn’t ready to run the kiln yet, but had some time to melt glass. 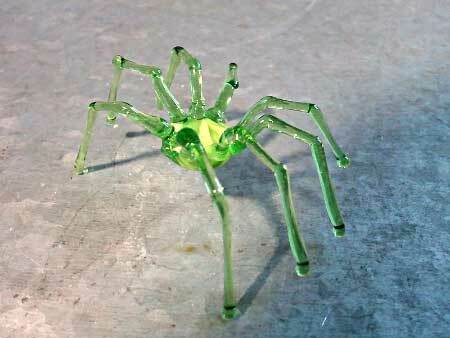 I got tired of pulling stringers, so I made this little green spider out of glass. (If this paragraph is gibberish – read below!) The span of the legs is about 2 inches, so it is a pretty big spider. I decided that I needed a mascot in my studio, so he will now supervise my work. 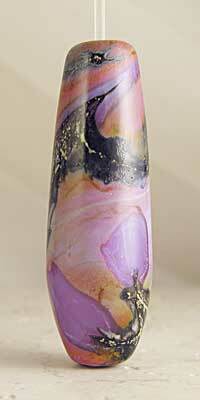 A kiln is a device used to soak glass at a certain temperature and to cool glass slowly. I helps to prevent stresses from building in the glass which in turn should make the glass stronger. I dislike turning it on and then going leaving it while I have to go run errands for hours. 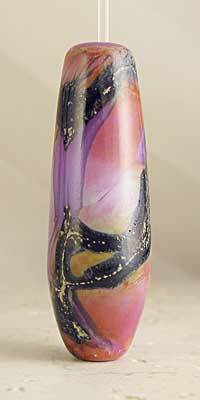 Stringers are threads of glass used to decorate beads or other glass objects. 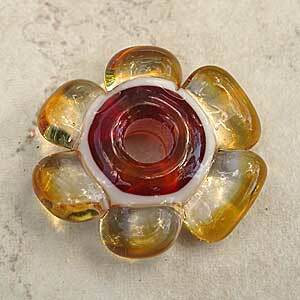 They are made by heating a glob (gather) of glass and then pulling it into various thickness. I have about a month’s worth of stringers all ready. I discovered that the little fellow is pretty durable. I grabbed one of the legs while it was still hot and my reflex was to drop it. It bounced on my workbench, but did not break. Had it broken – I would have been sad. Rosemarie Hanus usually makes beads, not spiders in her home studio in Bath Township, Ohio, USA. View some of here work as Spawn of Flame (and here). I got a couple of new pieces of furniture for my glass studio. We went to HGR Industrial Surplus – it was a huge warehouse of all sorts of, well, industrial stuff. Here is the heavy duty steel cabinet that is the new home for the kiln. I am going to paint it soon, but for now it’s a nice rust and gray. Here is my revamped desk. It was sagging in the middle and we have reinforced it now so that it is almost flat. And here is a huge, heavy duty cabinet that will soon hold my glass; it even has some nice dividers in the bottom that will help store the flat glass that I use. I have the oxygen concentrator on top of it. I am now starting a new round of Sylvie Lansdowne’s Facebook workshop; we are calling it “People Who Won’t Leave”! 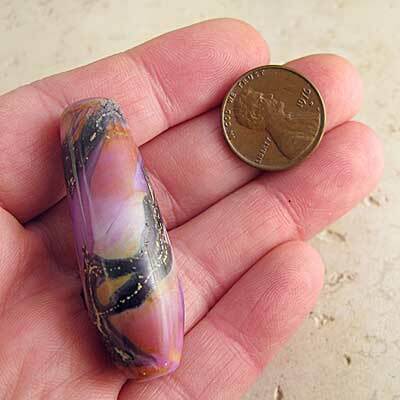 This is actually the second week of this round; it will take me a little while to get the nerve to show you my first week’s bead – it was less than aesthetically pleasing. Our assignment was to use something from our closet to inspire us. I do tend to wear a lot of solids and textured clothing, so at first I was a little stumped. Then I decided to use a knitted cable sweater as my inspiration, and to draw the cables with different colors. Cable Bead - First One! For “extra credit”, we were allowed to make more beads using different color schemes. Once I had made the first bead, I thought of some techniques that I could do to make the cables more uniform; I tried that on a few more beads. I like these and plan on expanding this concept. I even have some more ideas on how to streamline the process – right now, ot takes me a long time to make one!